Memoire on D'Orlic's properties on St. Domingue. Succinct and instructive memoire on D'Orlic's properties on St. Domingue, including diagram of the Ouanaminthe plantation, plus diagram of the plantation of Outapana, bought from D'Osmon. D’Orlic, Marie Dominique Jacques, 1748-1825. 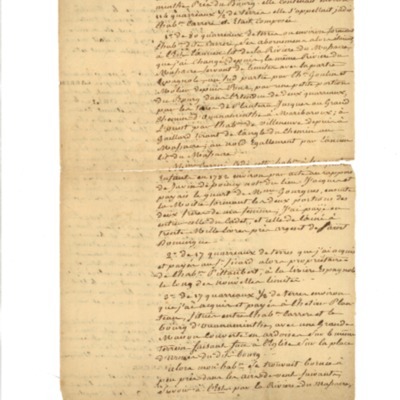 D’Orlic, Marie Dominique Jacques, 1748-1825., “Memoire on D'Orlic's properties on St. Domingue. ,” Catholic Historical Research Center Digital Collections, accessed April 21, 2019, https://omeka.chrc-phila.org/items/show/7900.